Email marketing has the potential to have the highest return on investment (ROI) of all your marketing efforts. The average salary for an email marketing specialist in Canada is about $45,000.00 / year, depending on location. For simplicity’s sake, let’s consider that your email marketing investment (noting that you probably end up spending a bit more on automation systems and producing content). So, with a $45,000.00 initial investment, you could, based on an ROI of 38-to-1 expect to see a return of $1,710,000.00. That doesn’t mean you should go out and hire an email marketing specialist and expect a 1-million-dollar return on your investment. Don’t do that. Don’t do email marketing just because it’s the thing to do and has (statistically) the highest ROI. In fact, if you attempt to do email marketing without first determining your objective and setting out a strategy, you may very well lose money. We all want our emails to be opened and shared. Just like we all want our social media posts to get liked, shared, retweeted, and commented on. Right? But do these actions mean success for our organization? While they might contribute to this success — more social shares mean more eyes on our content, which means a greater likelihood of more people completing the CTA — at the end of the day, these metrics are not as indicative of success as CTA clicks. For example, everyone loves a cat meme, except maybe people that don’t like cats, but I digress. Sometimes getting a cat meme is fun. We return to this blog post after an extended period away searching for the perfect cat meme to include. Please enjoy. If you too would like to disappear into the black hole of cat memes, please visit this pinterest page. I strongly recommend not letting your boss see. He most likely will not buy your feeble argument about the ROI of cat memes. Moreover, there is nothing wrong with strategically used memes and gifs. Nevertheless, I argue that these images only work when and if they are used strategically to gently ‘push’ the reader towards completing a predetermined action after they open and read the email. Do you want to get new leads? Do you want to sell a service or product? Do you want to build a relationship with your community? You will need to take the time to outline exactly what you want to achieve and do (i.e. send 2 email campaigns, 6 to 4 email segments), in what time period (i.e. 6 months apart), and what you want to get out of it (i.e. 10 new clients that each purchase at least $1000.00 from us). In addition, you will need to make sure this specific, time-based, and measurable goal, is realistic given your organization’s larger context and that everyone in the organization knows what you are trying to achieve and how. Last spring, we started working with a local HVAC company that hadn’t used email marketing before. They weren’t sure exactly what results they could expect from the initiative, but they had heard that email marketing has a great ROI. They wanted to try it to promote an upcoming series of rebate offers. To promote a series of upcoming rebate offers. To send out 5 or 6 emails to existing clients over a one-and-a-half month period letting them know about the available rebate offers and encouraging them to schedule an estimate. As you can see, the goal was specific, measurable, and time-based. Also, because this was a new initiative for the client they felt that even 1 or 2 sales as a result of the campaign would be a sufficient ROI to get them to pursue this channel further. This clarification the goal made it specific, realistic, measurable and agreed upon by all parties. Once you have a clear objective and well-defined goal for your marketing efforts, or at least you marketing campaign, you need to outline your plan of action. For many, this starts with designing a call to action (CTA) that will capture email addresses that they can then send emails to do. In Canada, according to CAN-SPAM laws, users must complete a double opt in when they sign-up. Now, that we’ve taken care of that important piece of information, let’s talk about how you can entice prospective clients and members to join your list. This is where knowing what you want to get out of your efforts and what you want your current or prospective clients to do becomes really important. You know what you want. Now, you need to decide what getting that wish met means to you. What are you going to offer your client or prospective client in return? Will it be a discount? A valuable piece of content or information? Essentially, you need to create a CTA that clearly outlines the benefit your (prospective) client will receive by signing up for your list, and what they can expect once they sign-up (i.e. one email a month or hundreds of emails a day). Building the List - Wait! What about the Journey to the CTA? You can’t just ask people for their email address, well, I guess you could, but it probably won’t get you very far. Image Credit: Jean Donaldson, Academy for Dog Trainers via Dogs Naturally Magazine. In dogs, this reaction is referred to as resource guarding (it’s not one you want to encourage), in humans, this is a natural reaction to too many people asking for our email addresses and then spamming us with useless content. 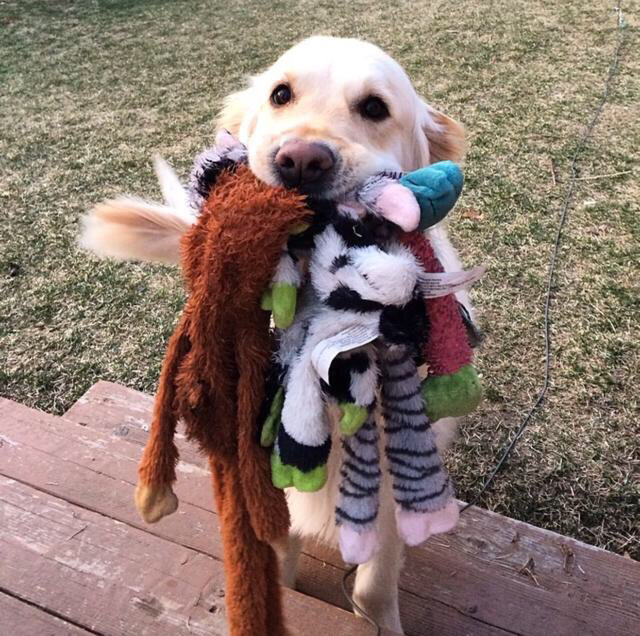 Either this dog really likes his owner, or, he’s getting a delicious steak in exchange for his stash of toys. When it comes to humans, you want them to give you their email address in exchange for that steak, err I mean, valuable content, discount, or promotional offer. Then, once you’ve wow’ed them with your amazingness, you want them to bring you all their work, kind of like the golden retriever in the image above. And, in case it’s not obvious, I’m a bit of a dog person. Just a little bit, but I digress. You have the email address, now what? USE IT RESPONSIBLY! DELIVER WHAT YOU SAID YOU WOULD DELIVER. Start with a welcome email. In other words, say hi and welcome them into your community. More importantly, if you’ve promised something, like a download or discount coupon, give it to the subscriber right away. Don’t make them wait. It’s rude, it and doesn’t serve you any practical purpose except to irritate your email subscriber, potentially prompting him or her to unsubscribe. Our HVAC client already had a list. When the company got a new client they asked if they would be willing to share their email addresses. We used this list for our campaign. Our first email explained the rebates available to the clients and the fine print associated with them. We sent 248 emails and 193 of those emails were opened. That’s a 69.4% open rate, considerably above the 19% industry average. We got 6 unsubscribes, which, while not great, is no cause for concern, especially given that this was a new initiative. The click rate was 4%, again above the industry average that sits at 2.5%. More significantly, this initial email resulted in 5 calls and 9 emails (a 5.6% email response conversion rate) and 8 scheduled appointments (a 3.2% appointment schedule conversion rate), which put us well above the modest goal of 1 or 2 appointments. As with any email marketing campaign, we ran a test on this email. The first email variation didn’t include a description for the rebates. The second email variation included a description of the rebates. While the open rate on the first test was higher, the click rate on the email with descriptions was better. This let’s us know that for future emails to this segment, we would want to include more descriptions. After you send the first email, you want to make sure that every subsequent email offers value and delivers on the promise you made on your call to action and your welcome email. Consistency: You want your emails to be recognized as coming from you and your brand. Thus, you want to make sure are making use of your logo and brand colors. Tone and Style: Let your personality shine through. People signed up because they like you, so be you. The tone and style of your email should also be, you guessed it, consistent with the tone and style of the rest of your communications. Personal: While email marketing needs to be a bit more formal than, say social media, it still needs to be personal and friendly. If at all possible, have the email come from a specific person and email address. When and How Often You Send Emails: Test when and how often you send emails. If you’ve promised to send a certain number, send a survey to ask clients if they like the number of emails they receive, or if they would like more or less. When I introduced the campaign Cheeky Monkey Media put together for our HVAC client, I indicated that we were testing whether 5 or 6 emails worked better. It turns out that neither option was the right combination. When we reviewed the results, we noticed that while the first 4 emails got email or phone call responses, we also saw an increase in unsubscribes after the 2nd email, which led us to believe that the magic number, at least for this company, was 2-3 emails per campaign. *Psst — Throughout this blog I assume (I know, shame on me) that you have a really good understanding of who your clients and email subscribers are. If you don’t, make sure you take the time to conduct buyer/user persona research or have an experienced team do it for you. Knowing that segmentation works is all well and good, but how should you segment? And the list goes on. Basically, the ways in which you can segment is practically endless. If you can imagine a difference, you can probably segment based on that difference. Should You Always Segment Your Email List? Should you segment, just for the sake of segmenting? No. If your list size is in the 1000s or 10,000s, you definitely need to segment. In fact, any time you have a 100 or more individuals on your list, it’s probably worth your time to segment your list. But what if you have a super small list, less than 100? This is where things get a bit tricky. Will the ROI you get from segmenting your list be worth the extra 3+ hours it will take you to segment your list and create different emails for each list? In these situations, it depends on the content you’re sending. If these individuals signed up through different calls to action (that promised different things), you have to segment; otherwise, you’re going back on your word and breaking your subscriber's trust. Not a good start to a relationship. The Mulan dragon giph might be cute, but your email subscribers won’t think you lying to them is cute. Let’s say you have a discount offer on cat food. If you have a list of 100 clients, and not all of those clients have cats, would you send the offer to all your clients? Probably not, you’d probably send the cat food discount offer to your cat people, your dog treat discount to the dog folks, and your freeze-dried mouse special to the snake people. Just imagine what would happen if you sent the freeze-dried mouse special to the 6 people on your list that own mice as a pet? However, if you’re sending general information or content to your whole list and your email list is less than 100 people, the ROI you’ll get from segmenting based on, say position, most likely won’t be worth sending a slightly different email to each segment. Remember above when I said that email can have an ROI of 38-to-1? You usually don’t get that kind of ROI on the first campaign you do for yourself or for a new client if you’re an agency. Rather, you need to test and fine tune your email campaigns. Truly, the list is endless. In the client examples I mentioned above, we focused on testing the amount of detail in email content (and found that more was better — who knew!) and the number of emails (in this case, we found that less is more). Could we have tested other things, like subject line, preview text, and CTA color/wording to name just a few? Absolutely. But not all at once. When testing email campaigns, you want to test one thing at a time. Yes, I know, we technically tested 2 things on the example I gave above. We cheated a little bit by testing the number of emails on the campaign as a whole and testing the amount of detail in the first email. While this may have skewed our results for the whole campaign slightly, the things we tested were separated enough to not disqualify the results of either. Remember the client example I describe above, where I noted that even though the open rate for the email with less description was higher, we picked the email variation (in this case the longer description) which had the higher click-through-rate as the winner? Why was the click-through-rate more important to our test than the open rate? Whenever you run a test, you need to know what success means. This takes us back to our very first point, outlining your objectives and defining SMART goals. Of course we wanted people to open the emails we sent them. However, it was more important to us that people engaged with the content and clicked on a CTA or contacted the HVAC company. Thus, success for our client, and for us, was defined as more conversions (clicks on email content as well as call and email inquiries). Beware of the #vanitymetrics I mention above. I find it easier to think of this in terms of blog posts, but it applies to emails as well. Let’s say you have a super click-baity blog post title. As a result, thousands of people click on the link and visit your site. That’s great right? Lot’s of site visitors = success. If those thousands of visitors spend 5-10 seconds on your site and bounce off, they are, for all extents and purposes, utterly useless to you. The same thing happens with your email. Let’s say you’re testing an email subject line. If 85% of your subscribers open it, and 40% promptly unsubscribe, and only 1 person contacts you, have you succeeded or do you need to go to the drawing board? Is the subject line clickbait? If it has nothing to do with the contents of the email than it doesn’t matter how effective it is at encouraging email opens. Maybe your subject line is good, in that while it doesn’t match the content, it promises to deliver what you said you would deliver when people signed up for the email. Fix your content, make it fit your subject line. Come on people. Seriously people. RESPECT your subscribers. I’m sure we’ve all, myself included, sent an awful marketing campaign in the past. Mistakes happen. But they don’t need to happen twice. We know better. More than that, we all know what it feels like to be inundated with more content than we could possibly consume in a lifetime even if it was good content. So, treat other people’s inboxes the way you would like your inbox to be treated. And, if you still feel stuck after giving these steps a try and iterating on the test you run, or just don’t have the time and energy to do it yourself, give me and the rest of the monkeys at Cheeky a shout. Emails us at [email protected]. We’re always happy to help.